Sibenik is an historic town, located in central Dalmatia. A notable feature about the town's history is the number of civilizations which have laid claim to the territory: Between the 11th and 12th centuries, Sibenik was claimed by Venice, Byzantium, Hungary, and the Kingdom of Bosnia. After the First World War, Italy briefly claimed Sibenik, and during World War Two it was occupied by the Germans and the Italians. As one might imagine, the town is the product of diverse influences and has a rich cultural heritage. Sibenik is home to the crowning glory of the Dalmatian Coast: the Cathedral of St Jacob. The cathedral was the masterpiece of sculptor Juraj Dalmatinac and is reputedly the largest church in the world to be built entirely from stone. It is unusual for its 71 stone heads on the exterior walls, a beautiful baptistery, the domed roof complex, and various works of art in the interior of the building. 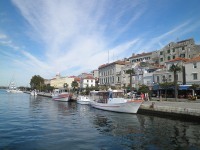 The city also makes a good base from which to visit the nearby Krka National Park.